AROUND 5,000 people braved yet another hot Saturday for the 71st Pyrford and Wisley Flower Show and Fete. The event chairman, Andrew Grimshaw, said there was a slight reduction in the number of exhibitors because of the heat but the day was still a great success. Andrew said the BMX bike display had proved to be popular, especially with younger visitors, and the dog show, which was run as a trial this year, was a success and it was hoped that it would be repeated next year. 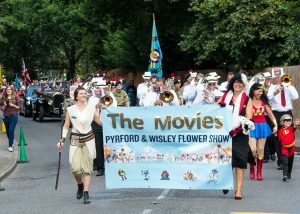 The theme this year was “The Movies” with villagers competing for family cinema tickets by listing the film titles from characters on the front page of the programme.